It is only recently that I've been experimenting with different types of succotash. I really like the combination of beans and corn with a little citrus and spice added. It's a great summer dish but can also be gratifying in winter. Here I use a sous vide hanger steak, which is a beefy, flavorful cut of meat that I really enjoy. This recipe showcases how simple it is to cook a tender cut of steak with sous vide. I use hanger steak in this example, but it works equally well with other tender steaks such as filet, ribeye, or strip steak. Unless you are pasteurizing them, the steak only needs to be heated through because the cut is already very tender. For most cuts this will be 2 to 4 hours, depending on the thickness. You can refer to the cooking by thickness for specifics, though going an hour or so longer will not adversely affect the meat. In this recipe you can also use cuts of medium-toughness such as sirloin or flank steak, though because they are a little tougher, you can increase the time they cook for a more tender steak. 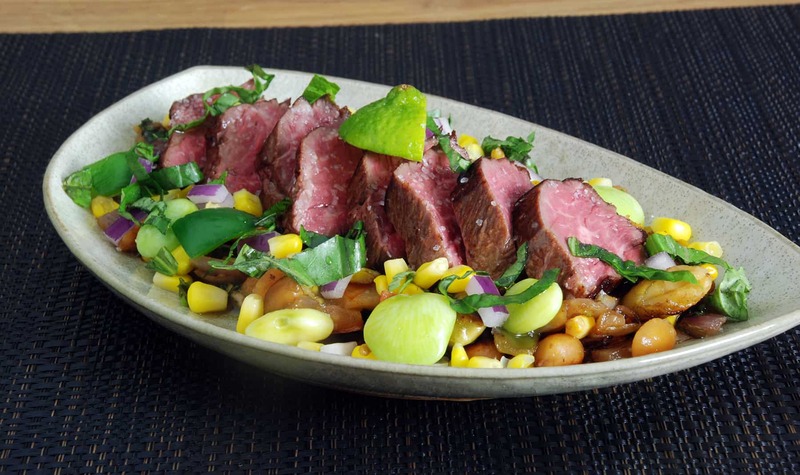 I pair it with a simple succotash, but you can use any sides you traditionally like to serve with sous vide steak. 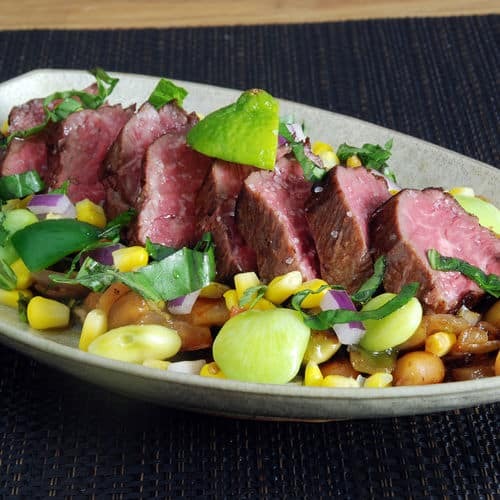 If you would like more information about the modernist techniques, ingredients, and equipment used in the sous vide hanger steak recipe with succotash you can check out the following. This recipe shows how simple it is to cook a tender sous vide hanger steak. I pair it with a simple succotash, but you can use any sides you traditionally like to serve with steak.